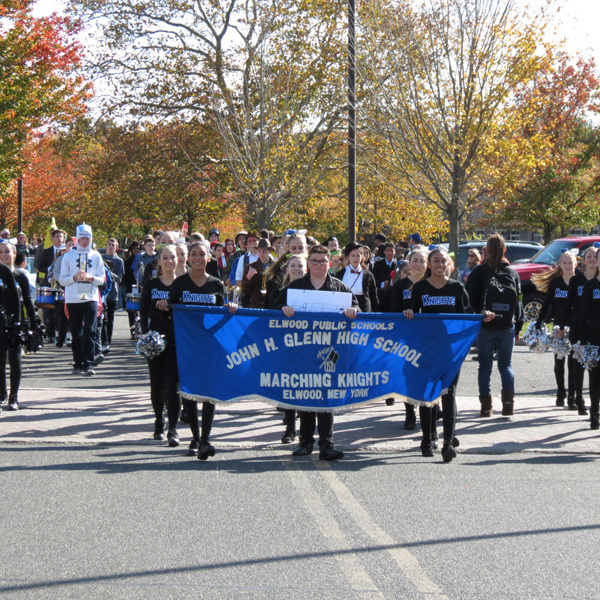 A wave of Knights pride swept over Elwood-John H. Glenn High School during its annual spirit week, leading up to the homecoming parade and game on Saturday, Oct. 31. The contagious energy radiating from the parade transferred to the bleachers as Knights fans cheered on the high school varsity football team during their battle against the Mount Sinai Mustangs for a football victory. At halftime, the winner of the float competition was announced and fans were treated to performances by the high school marching band, kickline, cheerleading and dance teams. In memory of Sean Urda, an Elwood student who lost his life last year, a white bench with an engraved message was presented and will be placed in an area near the high school. Thanks to the support of the energetic crowd, the Knights claimed a homecoming victory with a final score of 21-14.